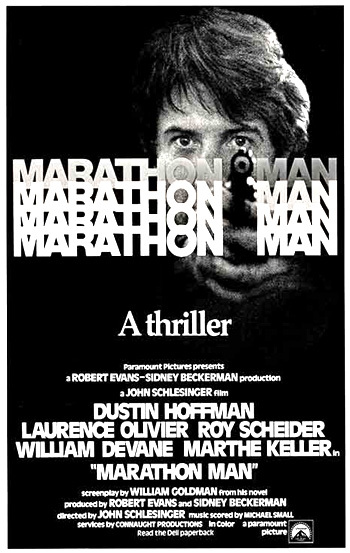 Marathon Man (1976) is a scary nightmare thriller, best known for the suspenseful pursuit scenes and a truly repellent scene of torture. Doc Levy (Roy Scheider), an American secret agent, who is thought to have stolen a valuable cache of diamonds (originally stolen from Jewish concentration camp victims), is killed by evil ex-Nazi Szell (Laurence Olivier), an ex-concentration camp dentist by profession. Szell has come to New York City to retrieve the fortune in diamonds from a safe deposit box. Szell kidnaps Doc's brother, lone, idealistic Jewish graduate student Babe Levy (38 year old Dustin Hoffman as a mid-20s grad student), who knows nothing about his brother's involvement. In two excruciating and grim scenes (the infamous scene was split into two segments), sadistic dentist Szell, the essence of disturbing evil, tortures tied-up Babe in a window-less room using probing and buzzing dental instruments on a tray -- in a chair, Babe is constrained while wearing a bathrope and striped PJ bottoms. After methodically washing his hands, Szell repeatedly and calmly asks the baffling question: "Is it safe?" Oh please, don't worry. I'm not going into that cavity. That nerve's already dying. A live, freshly-cut nerve is infinitely more sensitive. So I'll just drill into a healthy tooth until I reach the pulp...unless of course you can tell me that it's safe.